Dubai: Virat Kohli, who swept the International Cricket Council (ICC) top awards on Tuesday, created history at the annual event by becoming the first cricketer to bag the Sir Garfield Sobers Trophy for ICC Cricketer of the Year, ICC Men’s Test Player of the Year and ICC ODI Player of the Year for his performances in 2018. Acknowledging the honour, the Indian captain candidly admitted it was his hard work that made it possible. The result of his hard work in numbers is 1,322 Test runs at an average of 55.08 — including five centuries and 1,202 runs at 133.55 in ODIs, with six centuries and 211 runs from 10 Twenty20 matches, making him the top candidate for the awards. “Having recognition at the global level from the ICC is something you feel proud of as a cricketer because you understand that there are many players playing the game,” added Kohli, who bettered his performance in 2017 above all cricketers in the world. At last year’s ICC awards, he won the Sir Garfield Trophy and ICC ODI Player of the Year awards. He had also bagged the ICC ODI Player of the Year in 2012. 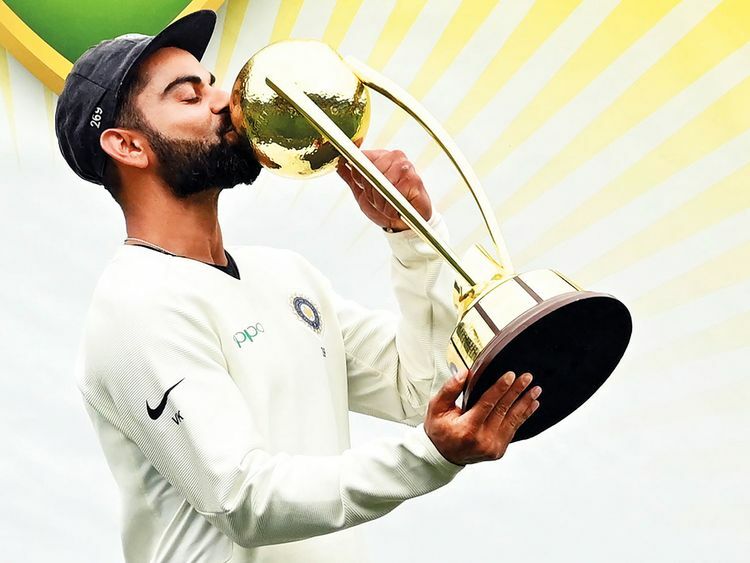 Kohli, who has become only the second player after Australian great Ricky Ponting to retain the Sir Garfield Sobers Trophy, was also named as the best skipper of the ICC Test and ODI teams of the year for the second year running. India’s rising star Risabh Pant, who became the first Indian wicketkeeper to score a Test century in England and equalled the record for the most catches taken in a Test with 11 scalps in Adelaide, was named Emerging Player of the Year. Australia opener Aaron Finch won the T20 performance of the year award for the second time for his 172 — the highest individual T20 score — against Zimbabwe in Harare last July. Scotland batsman Callum MacLeod bagged the associate cricketer of the year trophy while umpire Kumar Dharmasena was named the ICC Umpire of the Year and won the prestigious David Shepherd Trophy. Incidentally, South African fast bowler Kagiso Rabada came second in both the Cricketer of the Year and the Test Player of the Year categories. Virat Kohli: ICC Cricketer of the Year, ICC Men’s Test Player of the Year, ICC ODI Player of the Year. ICC Men’s ODI team of the year (in batting order): 1. Rohit Sharma (India), 2.Jonny Bairstow (England), 3.Virat Kohli (India) (capt), 4. Joe Root (England), 5. Ross Taylor (New Zealand), 6. Jos Buttler (England) (wk), 7. Ben Stokes (England), 8. Mustafizur Rahman (Bangladesh), 9. Rashid Khan (Afghanistan), 10. Kuldeep Yadav (India) 11.Jasprit Bumrah (India).